The NEA Working Party on International Nuclear Data Evaluation Co-operation (WPEC) provides a worldwide framework for co-operative activities among major nuclear data evaluation projects. The WPEC Subgroup 33 was established to study methods and issues for the combined use of integral experiments and covariance data, with the objective of recommending a set of best and consistent practices in order to improve evaluated nuclear data files. The subgroup has concluded that the statistical adjustment methodologies used worldwide are well understood and essentially equivalent. 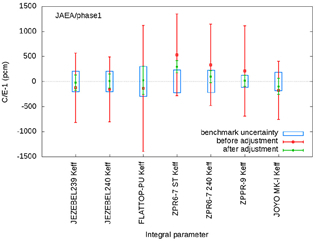 The results of the benchmark adjustments indicate common trends for important data, even when starting from different basic nuclear data and different covariance matrices. In this respect, these methodologies can provide a powerful tool for improving nuclear data and associated uncertainties. The report and more information on the WPEC are available on the WPEC web page. This volume is the 13th in the OECD Nuclear Energy Agency (NEA) "Chemical Thermodynamics" series. It is the first part of a critical review of the thermodynamic properties of iron, its solid compounds and aqueous complexes, initiated as part of phase 3 of the NEA Thermochemical Database (TDB) Project. The database system developed at the OECD/NEA Data Bank ensures consistency not only within the recommended data sets of iron, but also among all the data sets published in the series. This volume will be of particular interest to scientists carrying out performance assessments of deep geological disposal sites for radioactive waste. Download the PDF. At its biannual meeting on 2-3 December 2013, the NEA Committee on Nuclear Regulatory Activities (CNRA) approved the formation of a senior-level task group which will address defence-in-depth implementation issues identified at the June 2013 workshop organised jointly by the CNRA and the NEA Committee on the Safety of Nuclear Installations (CSNI). The CNRA also approved the release of three technical reports: Inspection of Licensee Emergency Arrangements, Fukushima NPP Precursor Events and Accident Management Insights after the Fukushima Daiichi Nuclear Power Plant Accident. Committee members were encouraged to send participants from their organisations to the 12th International Nuclear Regulatory Inspection Workshop in Chattanooga, Tennessee, which will be hosted by the United States Nuclear Regulatory Commission (NRC). During its 4-5 December 2013 meeting, the NEA Committee on the Safety of Nuclear Installations (CSNI) reviewed progress on eight safety analysis tasks undertaken to address high-priority issues identified following the Fukushima Daiichi nuclear power plant accident. Good progress is being made with deliverables scheduled for 2014. The CSNI also approved seven new safety analysis tasks and the release of seven technical reports. In addition, the committee agreed mandates for two new groups: the Senior Expert Group on Safety Research Opportunities Post-Fukushima (SAREF), which will identify safety research opportunities related to Fukushima Daiichi decommissioning activities, and the Task Group on Natural External Events (TGNEV), which will review the regulatory and technical approaches to ensuring adequate protection of nuclear facilities against natural external events, beginning with severe weather events. A new International Nuclear Emergency Exercise (INEX), one of the flagship activities of the NEA Working Party on Nuclear Emergency Matters (WPNEM), was initiated on 4-5 December 2013 following the finalisation of INEX-4 in May 2013. The WPNEM agreed on a road map for the technical development, approval and conduct of the exercise and targeted a time frame of 2015-2016. INEX-5 will be built upon the experiences and lessons learnt from past nuclear accidents/incidents and the successes of previous INEX exercises. INEX-5 will test the mechanisms for decision making at the national level, particularly in uncertain circumstances or in the absence of data; test the arrangements for international co-operation and co-ordination of data and information exchange among countries; test the arrangements for practical support and assistance between groups of countries or geographical regions; and investigate the longer-term issues beyond the urgent response phase. The exercise documents will be available by October 2014. INEX-5 will be open to all countries, including NEA member and non-member countries, and relevant international organisations. The next session of the International School of Nuclear Law (ISNL) will take place on 25 August-5 September 2014 in Montpellier, France. The programme, now in its 14th year, is jointly sponsored by the NEA and the University of Montpellier 1. The programme brings together leading experts in nuclear safety, security, non-proliferation and safeguards to provide an in-depth exploration of the legal aspects of the use and oversight of nuclear energy. Since its inception, the ISNL has provided a unique educational opportunity to more than 650 graduate students and professionals from around the world. The summer 2013 session brought together nearly 60 participants from 30 NEA member and non-member countries, from academic, professional and governmental backgrounds. The deadline for applications for the 2014 session is 31 March 2014. Additional information, including on applications, is available on the ISNL web page. The monthly bulletin only lists new and updated material. It is distributed by email to registered users of the Nuclear Energy Agency's Online Services. Registration is free; please use this link.